Looking for a special holiday dessert for a smaller party? 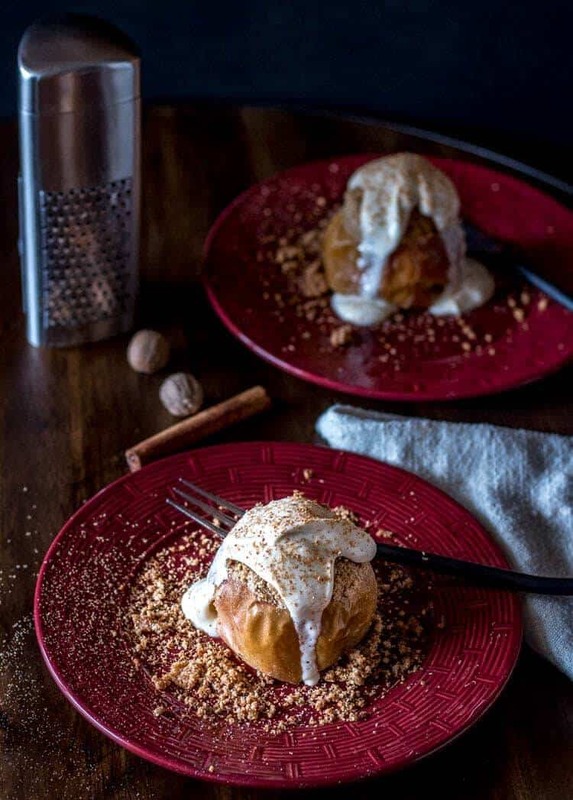 Gluten Free Streusel Baked apples with Bourbon Vanilla Mascarpone Cream tastes “fancy” (can you say bourbon?) but it’s so simple to prepare… even for A Cozy Thanksgiving Dinner for Two! All was not lost. 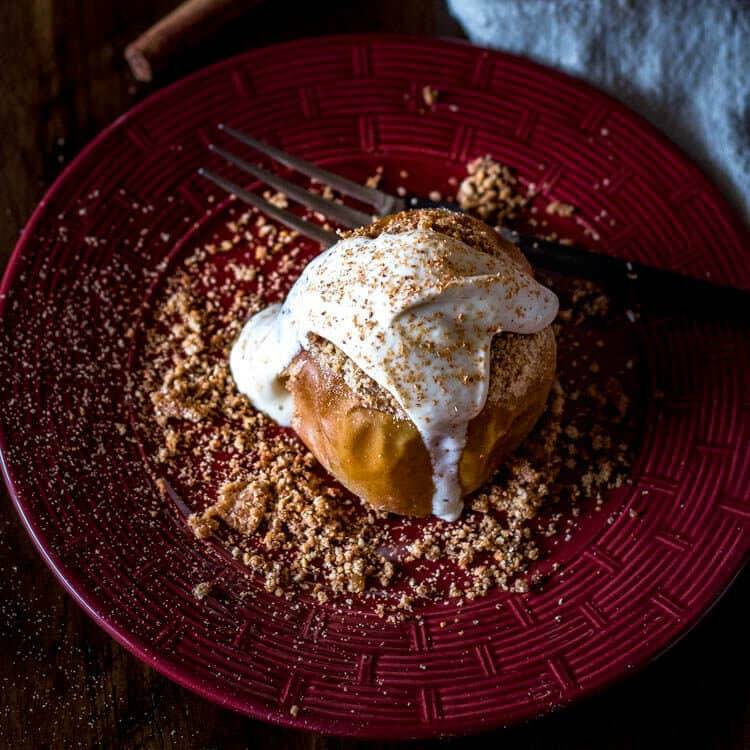 Monday morning, I started writing, and Monday afternoon, I started making Streusel Baked Apples with Bourbon Vanilla Mascarpone Cream. The baked apples make a perfect ending to any meal your holiday meal – it’s not too sweet and it won’t weigh you down. Let’s confess: I NEVER want a piece of pumpkin pie after Thanksgiving dinner. I’m not a huge fan to begin with (though I love many other pumpkin-based dishes! ), but the rich, HEAVY filling, and fat-laden pie-crust seems particularly unappealing after such a big meal. Is anyone with me on this? My gluten free baked apples are modeled after Alton Brown’s Baked Apples, mostly due to the fact that I’m not a “baker.” I always want to give credit where credit is due. Alton Brown is an authority (IMHO) on methods and techniques, and important things like oven temperature and cooking time. So, I play with the food, and Alton provides the chemistry. These lovely baked apples get broken down much like a pumpkin. Their cores get scooped out with a melon baller, then a teaspoon of honey goes in the cavity. Next they get a gluten-free streusel packed inside and spilling out. YUM! If I’d stopped right there, it’d be a delicious, simple dessert. But. Bourbon. And Mascarpone? I have a second confession: We ate our gluten free Streusel Baked Apples with Bourbon Vanilla Mascarpone Cream before dinner. 😯 That’s the food blogger life! I get better photos with natural light, and when the days are so short, sweets get photographed (and eaten) before dinner. Sorry Mom! These baked apples really are light, and perfect at the end of a heavy meal. I’d love to hear your Thanksgiving dessert thoughts! 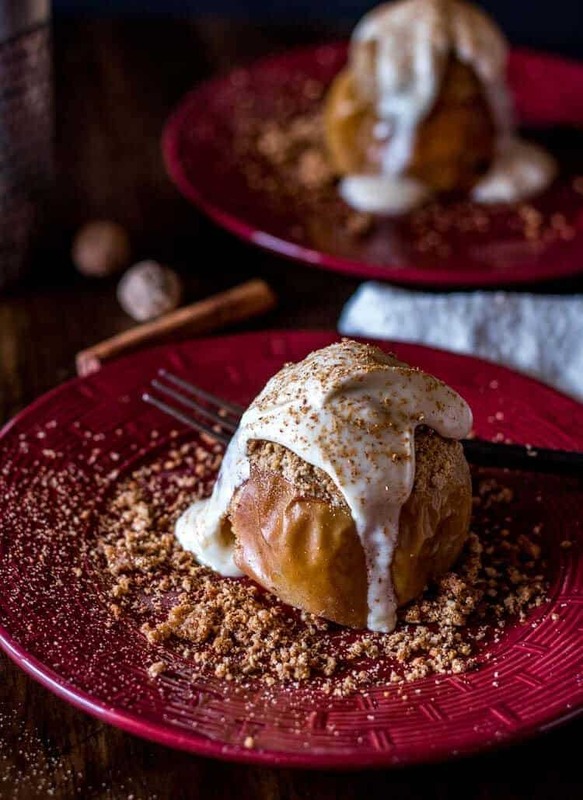 Beautiful, crisp apples get a gluten-free streusel stuffing, baked to tender perfection, and generously topped with a not-too-sweet Bourbon Vanilla Mascarpone Cream! 1/2 teaspoon cinnamon, I love Saigon cinnamon! 1/4 teaspoon nutmeg , fresh grated if possible! Prep the apples: Cut a tiny bit off the bottom to allow the apples to sit flat. Pierce the top of the apple, and run the knife at an angle toward the core. Turn the apple against the blade to remove a cone (similar to carving a pumpkin). Using a small melon baller, scoop the core out of the apple very carefully. See notes for a link to Alton Brown's how to video. Spray a small casserole dish or loaf pan with cooking spray. Set the apples close but not touching. Add a teaspoon of honey to each. Make the streusel. In a small prep bowl combine all the dry ingredients. Mix well Cut in the butter pieces using your fingers or a pastry cutter. When the mixture is crumbly, pack it into the apple cavities. Pile it loosely on top. Bake the apples until tender. Using silicone tongs to gently squeeze one is one way of checking. You can also pierce one with a fork, and it should slide in and out easily. Remove apples from oven, and allow to rest for 10-15 minutes. While apples bake, put all the mascarpone cream ingredients in a small blender or processor. Blend until smooth and creamy. Add a little additional yogurt if the mixture is too stiff. To serve: Plate 1 apple (transfer carefully!) Top generously with the Bourbon-Vanilla Mascarpone Cream. Garnish with a grating of fresh nutmeg if desired. Important: Don't choose just any apple for baking. You need an apple that retains some firmness after being baked. My favorite is Honeycrisp. See The Best Apples for Baking from Bon Appetit. Alton Brown's video does a good job of showing how to prep the apples. It's pretty easy! Mascarpone is an Italian cream cheese made from milk and an acid - lemon juice, vinegar, citric acid, or acetic acid. 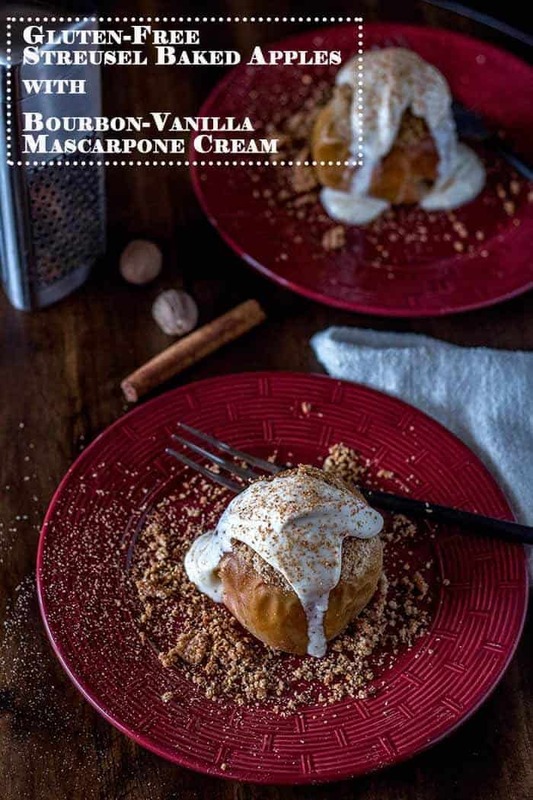 Substitute cream cheese if you can't find it, but mascarpone is a treat! I set my mascarpone out to soften like I do cream cheese. Using your fingers or a pastry cutter when combining the streusel dry ingredients with the cold butter. You want crumbs (not paste), so do NOT use a processor.